Say it Ain't So by Josh Berk. A Lenny and the Mikes Book. 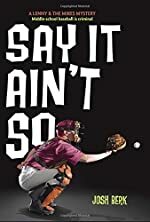 Review: Say it Ain't So is a book about three 7th grade boys that are, in way, detectives but also two of them are baseball players (Mike and Lenny). Mike and Lenny love baseball it is their dream to play professional baseball for the Philadelphia Phillies. Mike used to be a pitcher until he broke his arm; he is now the Schwenkfelder Mustangs' starting catcher after Davis Gannet (an 8th grader at Schwenkfelder Middle School) had stolen Kyle Webb's father's phone. Once his dad finds out that Davis stole his phone, he told Coach Zo, and Davis was kicked off the team. But there was another mystery on their hands; someone on the Griffith Griffins was sealing their secret system for relaying a pitch type. This could ruin them! But they found out that it's not one person, it's three! The book is amazing I recommend this book for people in grades 6 through 8 because Say It Ain't So has some sophisticated wording here and there. I am not really into baseball but this book made me a little more interested. Say it Ain't So overall had a great storyline and well balanced characters. The genre of the book is mystery with realistic story tale elements. I'd say my favorite part of the story is when Mike, Other Mike, and Lenny figure out who is cheating and who stole the signs. It was a real game changer! We would like to thank Random House for providing a copy of Say it Ain't So for this review. Have you read Say it Ain't So? How would you rate it?